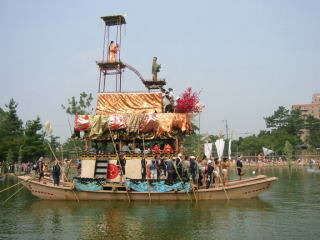 Tsushima Tenno Festival is one of the top three famous river festivals in Japan. 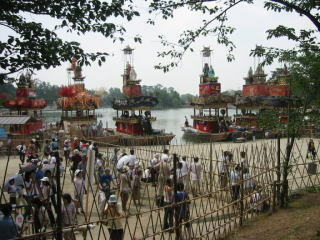 (boats with large strawsheaves/makiwara decorated hemisphericaly with illuminated lanterns) are set afloat on the Tennoh river. The glittering reflected light of lanterns on the surface of water is so beautiful. 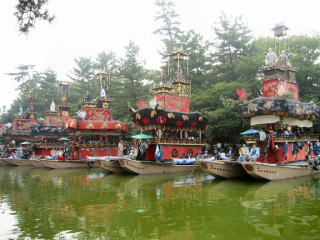 Mabashira has 12 (13 in leap year) lanterns which shows months in a year. 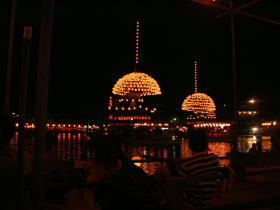 The hemisphere is shaped by 365 lanterns which shows one year though they put approximatery 400 lanterns in reality. 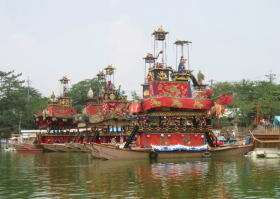 At the front of boats, there are 30 lanterns called "Miyoshi-nagashi"which shows 1 month. Aside from these lanterns, they put several kinds of lanterns: noki-jochin, takabari-jochin, yumihari-jochin, hako-jochin, toro, etc. There are a few stories about the origin of the festival. in order to save Prince Ryoou (grand son of Emperor Godaigo/ Southern side) who escaped to Tsushima. 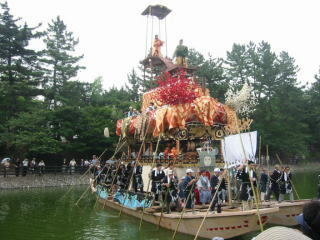 Someone says that this festival was based on the shinto ritual of Tsushima Shrine, "Miyoshi-nagashi". But no one knows the real story about origin. 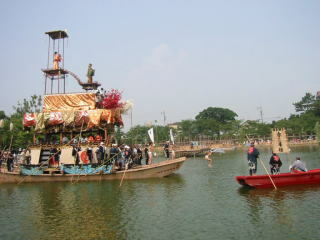 and has been grown as a popular festival. 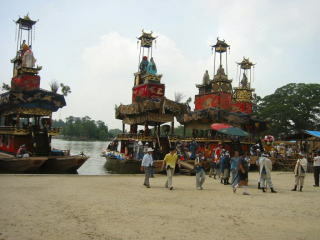 The festival had been held on June 14th and 15th of the lunar calendar until 1962. 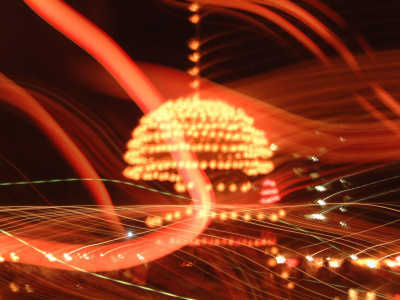 But since 1963, it has been held on the fourth Saturday and the following Sunday of July in the solar calendar. 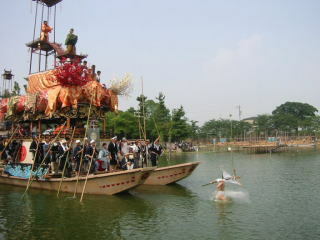 In 1981, Tsushima Tennoh Matsuri was designated as a national intangible folk cultual asset. 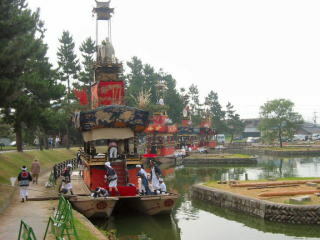 tedutsu-hanabi ( a kind of fireworks ), etc.
. You can see dolls wearing Noh costumes on the top of the tower on the boats, and also listen to the old kagura music played by bands on the boats. and dedicate the pikes to the gods there. which offerd by Saya Cho (Saya Town) Jump ! and then visit Tsushima Shrine. Get off at Tsushima Sta. on the Meitetsu Line.